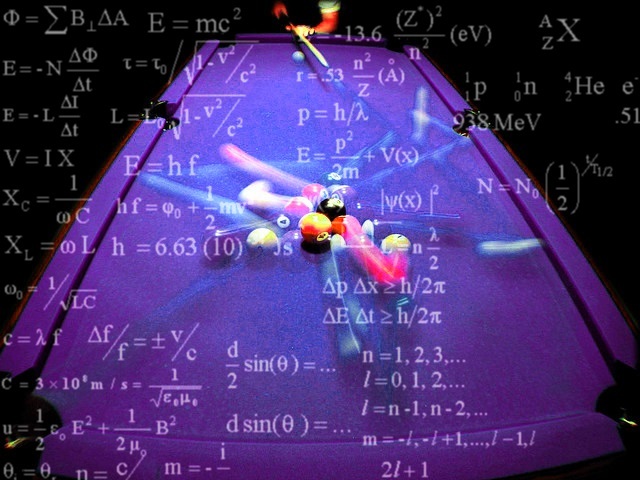 Imagine we had perfect information about the “break” in a game of pool. The weight and shape of the balls, the velocities and trajectories, the resistance in the surface, air temperature and humidity etc. With this perfect information we could calculate accurately the exact positions of all the balls when they came to rest. That’s because the pool balls obey the laws of physics. As do all particles in the universe. If we accept the above scenario as true then it follows that if we had perfect information about the moment of the Big Bang, then we would be able to predict perfectly the positions and velocities of all the stars and planets at any given time. Because again, all particles follow the laws of physics. If A is true, then B is True. Complexity does not change anything. The laws of physics are obeyed and we have perfect information. Now, the other thing we would also know in advance is every conversation ever had between any human beings ever (If you’re objecting with quantum mechanics and Heisenberg’s uncertainty principle, hold that thought!) because human brains and the electro/chemical reactions in them also follow the laws of physics. Science simply does not have a concept for an entity outside the physical universe which could act on the physical universe (ie: brain) to create volition. This is determinism, and the general riposte is to point to the afore mentioned Quantum mechanics and in particular Heisenbergs uncertainty principle. The idea being that truly random events do occur and therefore cannot be predicted forward or extrapolated backward. But even if we consider that these quantum fluctuations are indeed random and not simply a result of our inability to predict them because, essentially, our observation of one factor precludes our measurement of another factor (a predicament which our hypothetical “perfect information” wouldn’t be subject to) then we still have not allowed the genie of free will into the equation because dancing to the tune of a tumbling dice (no matter how many sides it has) is still not free will. Undoubtedly we feel the sensation of free will. But then, in a 3D film we experience the sensation of depth in a 2D screen. Sensation is not evidence of fact. To the ego, or the perceived mind which thinks itself a separate entity, this idea that free will is a kind of illusion is confronting. Yet in awakening it is seen that what we truly are, the I AM, the singular awareness in which everything is occurring, is the ultimate expression of freedom. Intelligence is perhaps not the right word (and no word or words get close) but the omniscience of the absolute in allowing the universe and everything (apparently) in it, is a beauty and love and intelligence beyond our comprehension. To experience the universe in time and space is the way human beings are built. It’s the way our senses and our minds function. It is hard, almost impossible to step out of that thinking, yet it can be put down and it is seen that the 3 dimensional universe cast in linear time is one projection of the All. One possible extrapolation of information. Quantum physics and String Theory explore other ideas. Most importantly we don’t have to understand it. We can’t fully understand it. All we do is incrementally increase our understanding. Regardless, the freedom from being the doer, the one responsible for making the right choices is liberation! It doesn’t suddenly make us careless or reckless, all beings act according to their nature. It lets us drop the pretense that we are individual engines of volition and resume the dance of the cosmos with lightness, awe and love. Scientifically speaking, we are biological organisms. Like all other biological organisms, we come with a built-in purpose: to survive, to thrive, and to reproduce. This purpose animates us to explore our environment to find the means of our survival. It is the underlying source of our volition. We are not separate from reliable cause and effect (determinism). The physical laws of nature don’t just hold atoms together and keep the planets in orbit. They also keep our blood running, give power to our muscles, and provide the neurological framework in which we think and feel. Those mental processes, by which we learn and plan and imagine and evaluate and choose, well, that’s all us. The fatalistic view, that we are victims of causation, as if it were controlling us against our will, is false. It is authentically us causing stuff and making things happen according to what suits our purpose, our reasons, our feelings, our genetic disposition, and our prior life experience. All of that is us. Free will is nothing more, and nothing less, than us making choices for ourselves. The “free” means that we are not forced to choose or act against our will by someone else. It is freedom from coercion or subordination. It is not “freedom from causation”. In all practical examples of free will, there is no presumption of freedom from causation. For example, when the Boston Marathon bomber hijacked a car and forced the driver to aid in his escape, the driver was not guilty of “aiding and abetting” because he was not acting of his own free will. The idea of “freedom from causation” belongs to the abstract world of philosophers and theologians. And that is where all of the debate resides. To clear up any confusion, those wishing to debate the possibility of “freedom from causation” should start calling it that. It is wrong to attack ordinary free will. The distinction between those acts we perform voluntarily from those which we are forced to do against our will, is meaningful and relevant. I thank you for commenting on my blog. I appreciate your views.